Alma Hernández joined the California Budget & Policy Center’s board of directors in June 2017. She is the Executive Director of Service Employees International Union (SEIU) California, which represents 700,000 members and their families and is the largest labor union in the state. Inspired by her immigrant parents and family, Alma joined SEIU in 2010 as political director to further the union’s mission of providing dignity and a voice for working people. In this role, she built the organization’s field capacity, ran independent-expenditure campaigns, and helped SEIU build the political power of the new California majority: Latino, African American, and Asian and Pacific Islander voters. 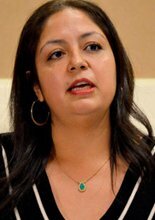 In 2016 Alma became the first Latina to occupy the role of SEIU California’s executive director. Prior to SEIU, Alma spent five years as staff in the California Legislature, worked as a lobbyist in Sacramento, and managed numerous statewide political campaigns. Alma received her bachelor degrees in rhetoric and political science from the University of California, Berkeley. I love our diversity, our food, and the Bay Area/California weather! I love going back home to the Central Valley. It’s where my heart is. I mostly only watch/listen to Spanish TV and radio. So, I struggle to keep up with American pop culture references.